Packed with vitamin A, vitamin E, and essential fatty acids, raw shea butter is an all-around hair and skin care product with origins in West Africa. For decades, it has remained a favorite ingredient in the hair and skin care industry for multiple reasons. The shea butter that most of us are used to is a butter that is extracted from shea nuts of the shea-karite tree. This buttery substance is usually then further processed to meet the needs and demands of the end user. However, many naturals have started purchasing the butter online in its raw form and whipping up their own product into a consistency that might be easier to apply to their hair or skin. Doing this can also provide DIYers the opportunity to add other carrier and essential oils to help enhance the natural properties of shea butter. While there are many benefits of Shea butter on natural hair, here are the top 3 reasons why so many community members love this all-natural ingredient. When used often and consistently, shea butter has been shown to improve the texture and feel of the hair. This is because the essential fatty acids in shea butter deeply penetrates into the hair shaft to smooth the cuticles and to soften the hair strands, which then gives the hair a silky feel. The rich vitamins A and E contents in shea butter helps to soothe dryness, minimize breakage and curb split ends. The thick consistency of shea butter also makes it a great sealant to use in cold environments, particularly in the winter time. Raw shea butter's creamy, thick consistency helps to trap in moisture to the strand for a longer period of time. Shea butter has been found to contain low levels of UV protection (around SPF-6), making for a great natural "sunscreen" for curly and coily hair. When applied onto the hair, shea butter coats the surface, acting as a shield against the damaging, drying effects heat exposure can cause. This also applies to styling hot tools and even chlorine in a swimming pool. Trust us--it's actually pretty simple. Is shea butter right for your hair type? Many naturals sometimes complain about their hair being weighed down from using raw shea butter. This could be due to the density and thickness level of their hair-- as well as amount of other products that they cocktail with it. Medium to thick hair texture types can handle shea butter without being weighed down, whereas, a fine hair texture might feel weighed down, especially if too much of the product was used. It is important to not be heavy handed when using shea butter. A small amount can go a long way! 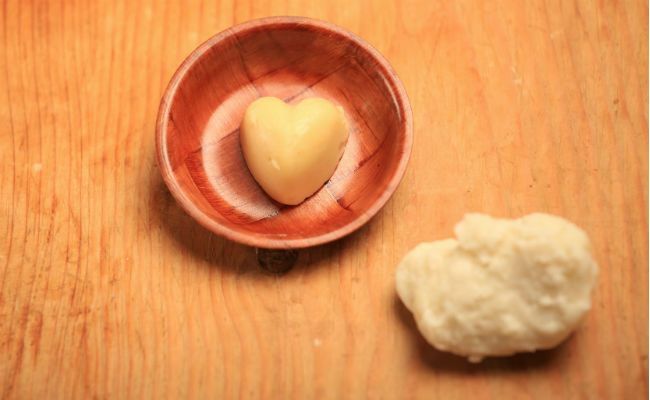 Do you heart shea butter?